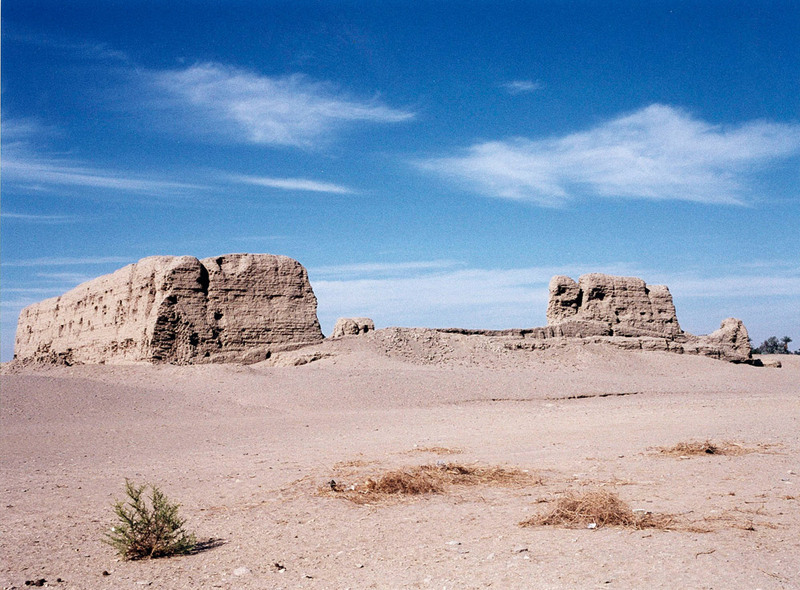 The Southern sacred city of Hieraconpolis (Nekhen in Egyptian) was a place of pilgrimage for millennia, from pre-dynastic times until the end of pharaonic civilisation. 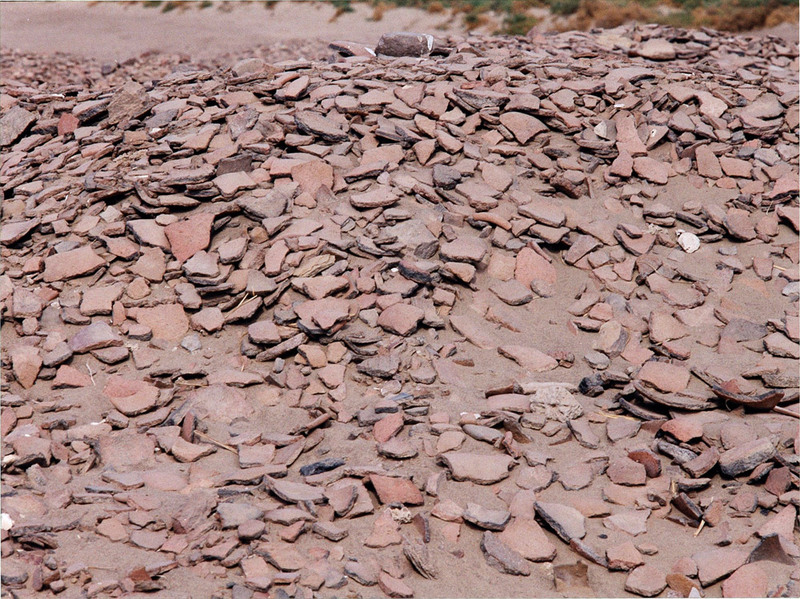 Here we see a small percentage of the millions and millions of shards of pottery brought as offerings by pilgrims, who threw them to the ground and smashed them as sacrifices to the gods and to the ancestral spirits. There are probably more shards at Hieraconpolis than there are people in Egypt. 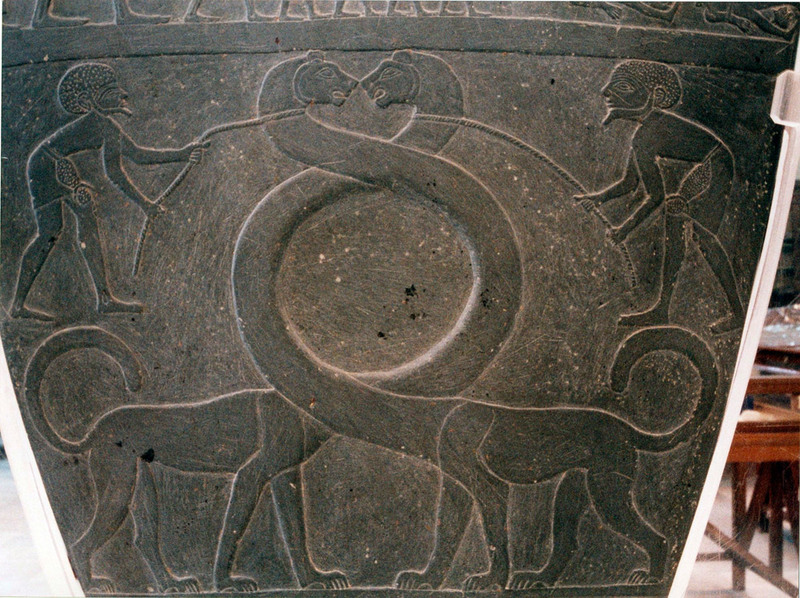 Detail of top of the obverse side of the Narmer Palette showing King Narmer (left) wearing the red crown of the north (which he has just conquered); his name in hieroglyphs is suspended in space directly in front of his head, and the sign at the top is believed to represent a catfish, so maybe he was a ‘Southern soul brother’. 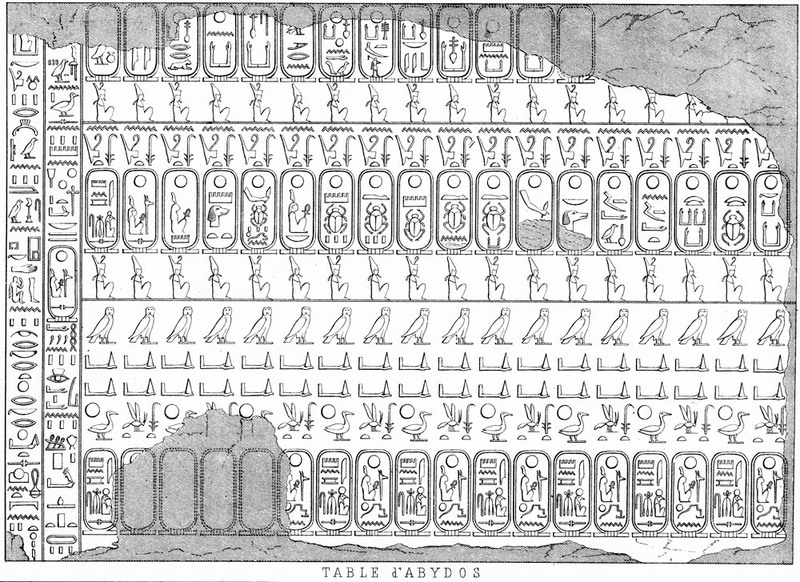 This name is also shown larger in the centre of the top register, with bits of a palace façade motif to either side of the bottom hieroglyph (believed to show a bull’s thigh). He is advancing towards the bound and decapitated bodies of ten of his northern enemies, whose heads with Libyan-style goatee beards lie between their feet. 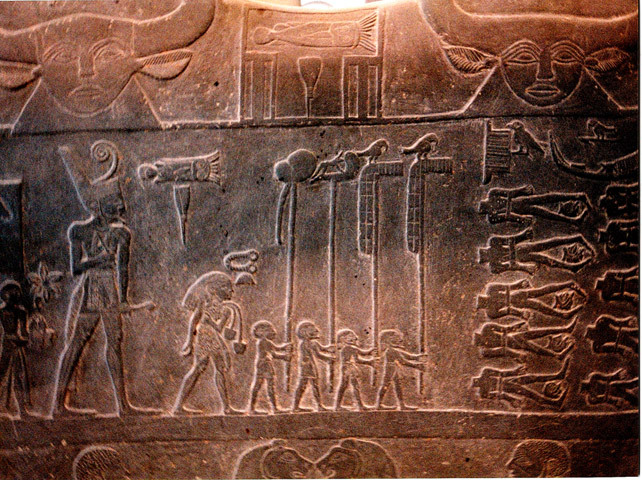 The four standard-bearers marching ahead of Narmer carry four standards, as follows: two standards showing Horus as a falcon sitting on his sacred ‘perch’ made of reed bundles (probably Horus of the North and Horus of the South), a sacred dog, probably Upwawet who as a pathfinder was a form of Anubis, and a uterus with trailing umbilical cord, presumably representing the king’s ka or ‘double’ who embodies his spiritual force. The person directly in front of the king is believed to be his sandal-bearer. 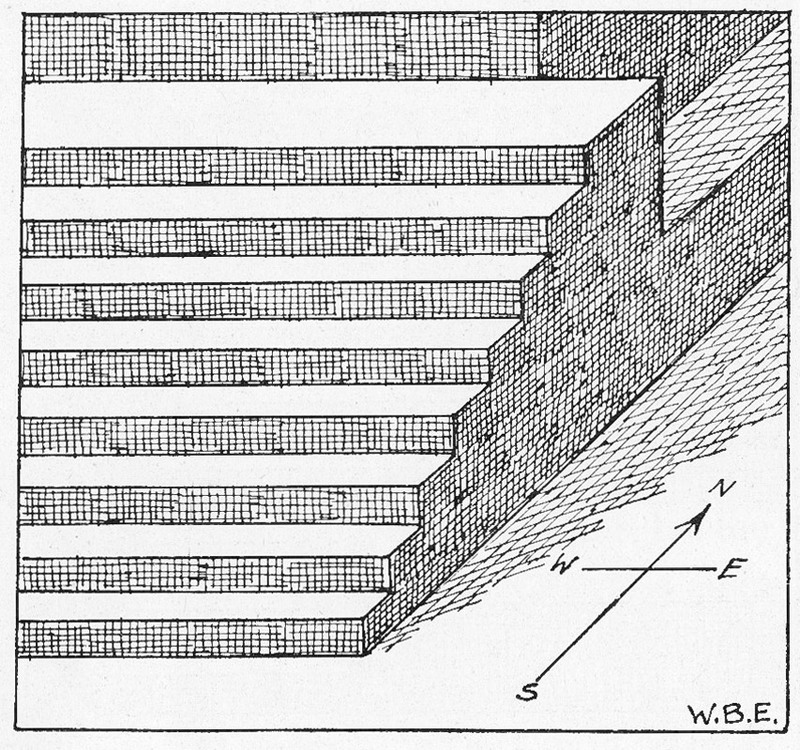 This cutaway diagram shows the steps of the excavated Step Pyramid tomb of King Enezib (or Anedjib), fifth king of the First Dynasty, which was discovered at Saqqara in 1937 by Emery and at first attributed to Nebetka, a royal official lived under Enezib’s reign. 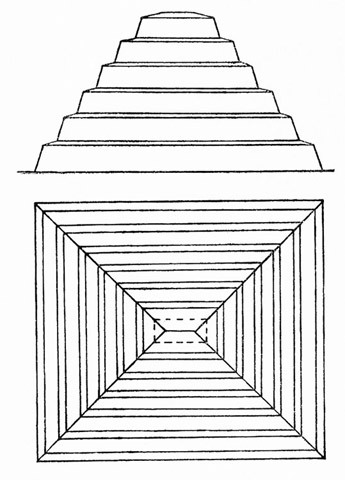 We see also in this drawing that the structure is oriented precisely to the cardinal points, as are the Giza pyramids. 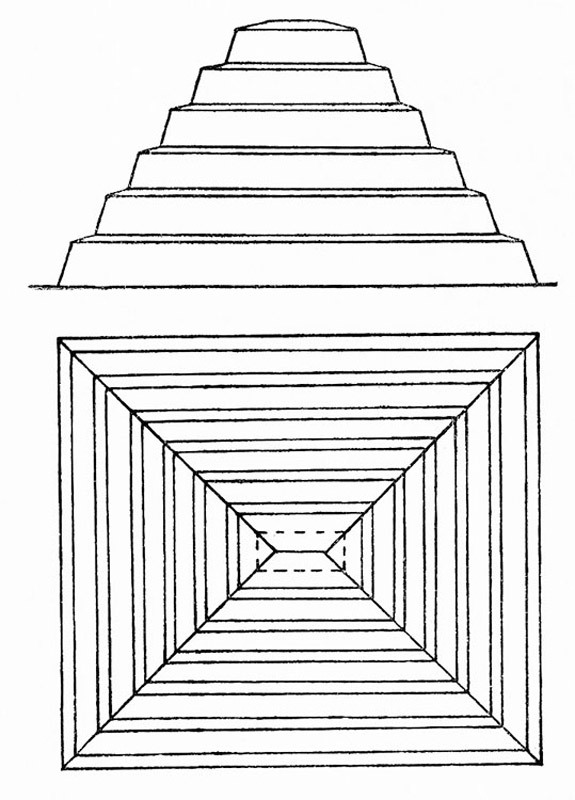 (Figure 64 from Walter B. Emery, ‘A Preliminary report on the Architecture of the Tomb of Nebetka’, Annales du Service, Cairo, Vol. 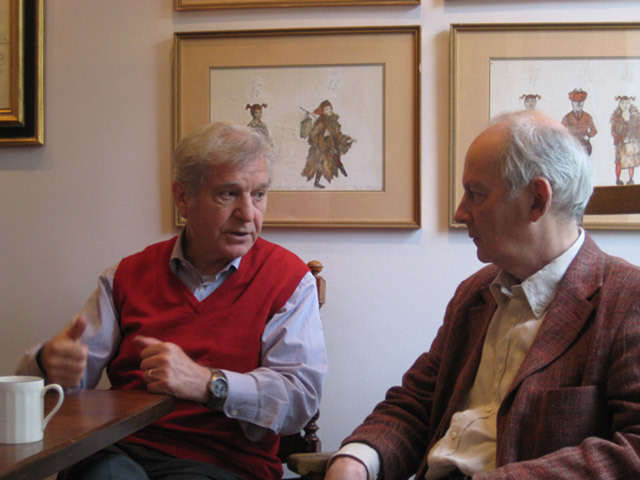 38). 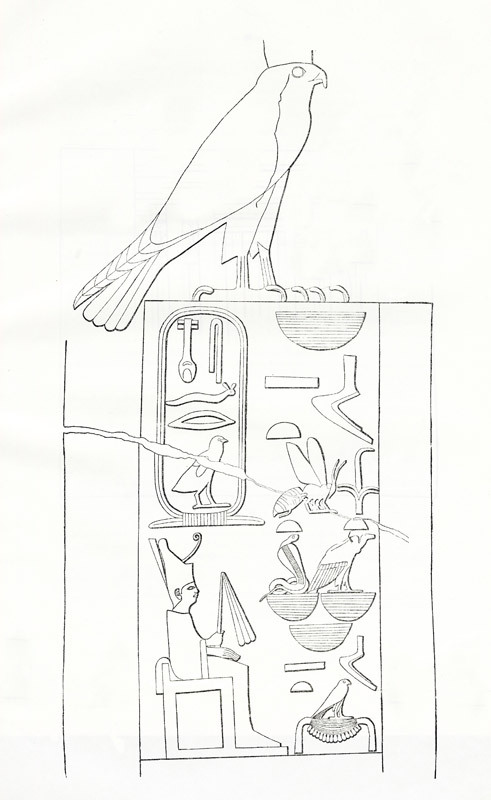 A fuller report on this tomb was published eleven years later in Walter B. Emery, Great Tombs of the First Dynasty, Volume I, Cairo, 1949, where this drawing is Figure 38-A on page 84, and the tomb has been numbered Tomb 3038. After some years of further debate and consideration, Emery decided that there might be ‘some more startling possibilities’ about this tomb than just belonging to a royal official. 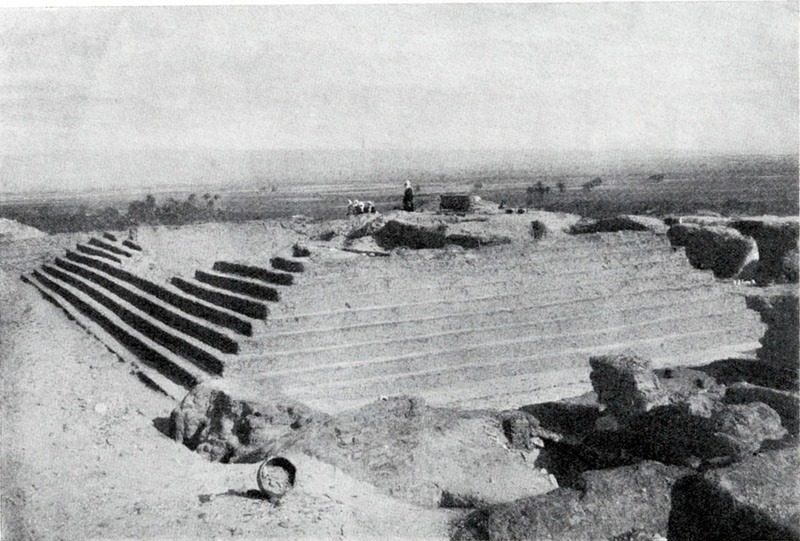 It was originally constructed as a stepped pyramid! The top was then cut off, and the pyramid form entirely concealed by a new superstructure in the conventional tomb form with a frontage of what is known as ‘the palace façade’ design. 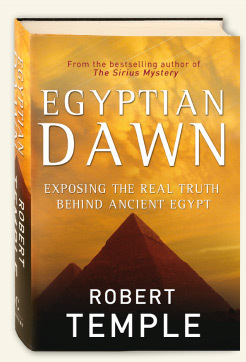 In 1961, Emery finally said what he thought this tomb really was; in his book Archaic Egypt, he said : ‘The building is dated to Enezib, and, although the name of an official called Nebitka occurs on jar-sealings, etc., it would appear probable that it is the burial place of the king.’ (page 82) See discussion in main text. This is the famous ‘Tablet of the Kings; carved on a wall of a corridor in the Temple of Seti I at Abydos in Upper Egypt. Since it is impossible to photograph the carving face on, due to its width and the narrowness of the corridor, this engraving of it is invaluable. (It actually extends further to the right.) 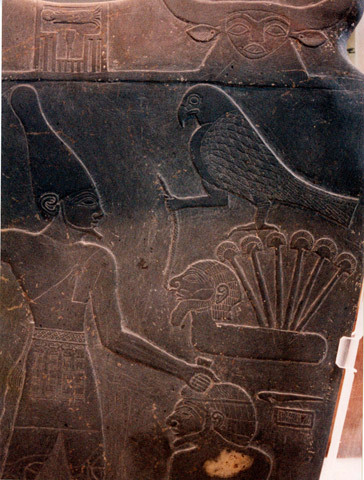 Seti I, second king of the 19th Dynasty, is seen making offerings (he holds an incense pipe in his left hand) to the spirits of the royal ancestors. He is preceded by a priest. 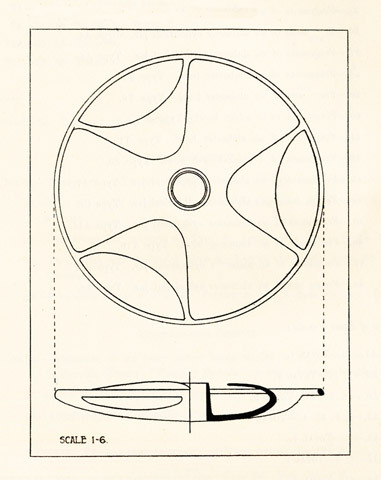 This engraving was published in Sir Norman Lockyer’s The Dawn of Astronomy, London, 1894, p. 21. 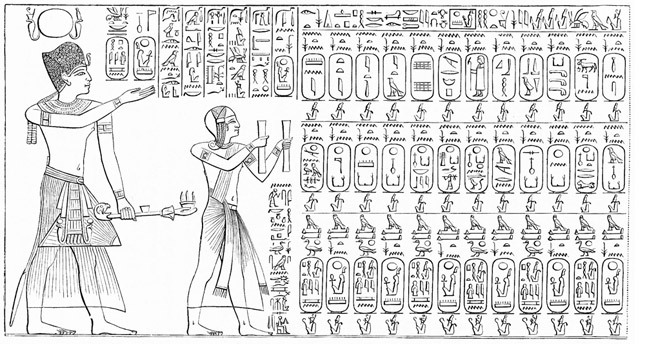 This king list is now generally known by the name of The Abydos King List. 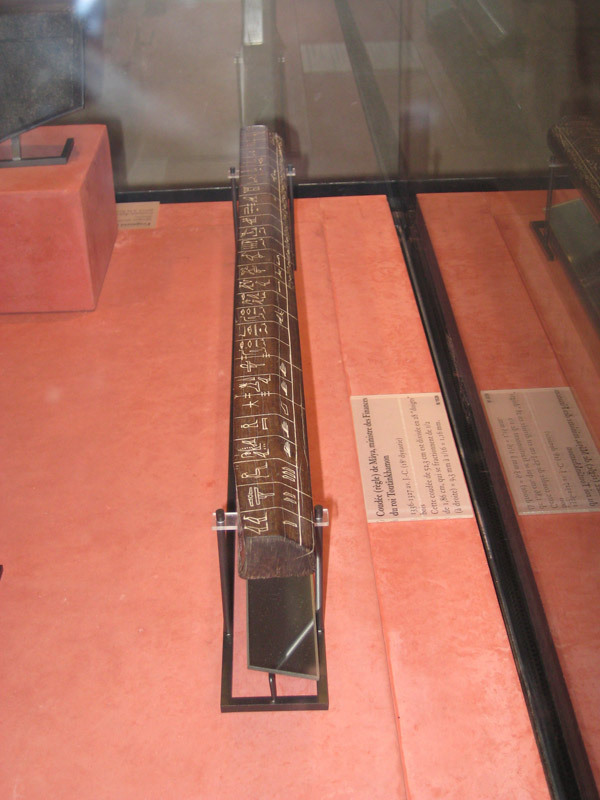 Each cartouche contains the name of an ancient king, whose spirits is being honoured. Heretical kings such as Akhenaten and his son Tutankhamun are omitted from this List, which was for ceremonial purposes, as their spirits must not be honoured. 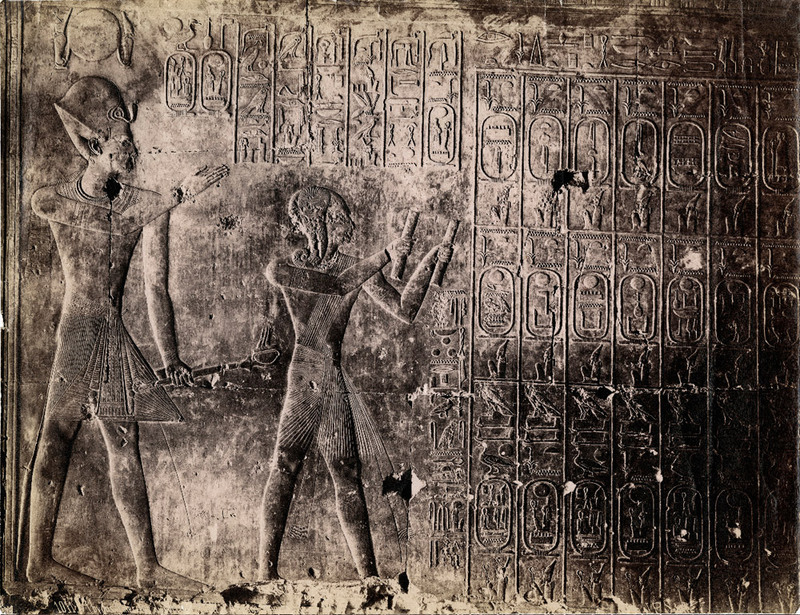 Seti I’s temple at Abydos was really a ‘Temple of the Royal Ancestors’ culminating in himself. One of its purposes was to strengthen his claims to legitimacy by portraying him as the direct successor of all the dead kings from earliest times. It is believed that he carried out elaborate ceremonies to honour the dead kings at least once a year in person. At that time, all of their names would have been recited aloud. 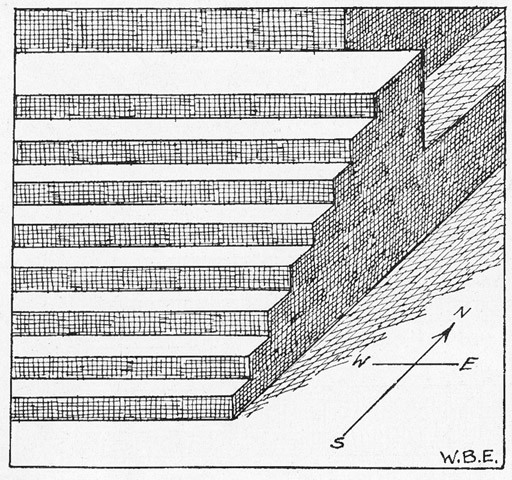 Jean-Philippe Lauer’s diagrammatic section of the Step Pyramid at Saqqara, showing in its shaded portions its three construction phases above ground level (below ground is shown as white). 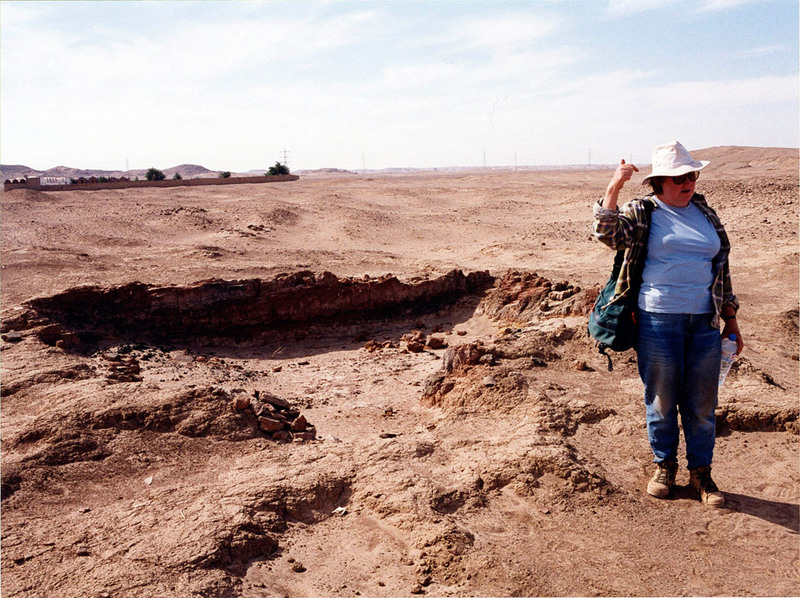 Phase One is the squat rectangular mastaba at the base, labelled ‘Initial Mastaba’. Phase Two is Pyramid 1. Phase Three is Pyramid 2, which is what we now see from the outside, secretly encasing the two earlier structures entirely. This was all done within the lifetime of King Zoser by his architect, Imhotep, and it was all done on purpose. The question is: why? Until now, it has been presumed, for want of any other explanation, that the pharaoh and his architect could not make up their minds, and that they first decided to build a mastaba, but were not satisfied with it, and then build a small pyramid on top of it. But then, dissatisfied still, they built yet another pyramid, much larger this time, which swallowed up both of the earlier structures (which were only discovered by Lauer’s probings and excavations). However, this explanation suggests that they were rather foolish and dithering, and does not fit psychologically somehow with what we know about Imhotep as reputedly the greatest individual genius in Egyptian history. But now a surprising alternative resents itself: perhaps Imhotep was making a definite ‘statement’ of a political and cultural nature. 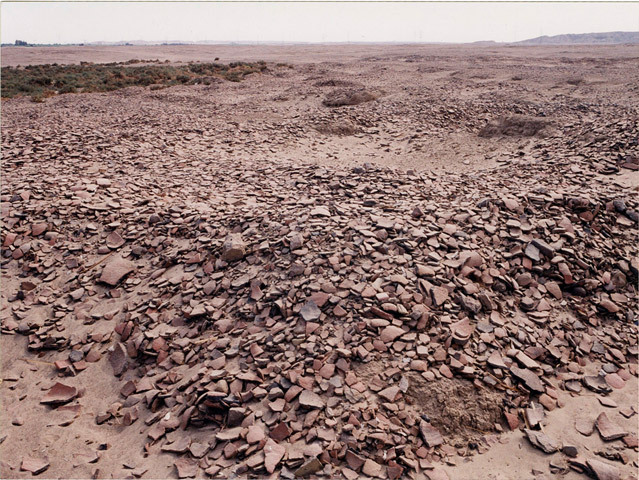 For what he did was precisely the opposite of what King Semerkhet of the First Dynasty did: Semerkhet decapitated his predecessor, King Enezib’s, pyramid at Saqqara and built two successive mastabas over it. Imhotep did the exact reverse, also at Saqqara, starting with a mastaba and then building two pyramids over it. This may have been intended to have, not only a political and cultural significance, but a magical significance as well: undoing the ‘bad magic’ of a previous age by reversing it with corrective ‘good magic’. 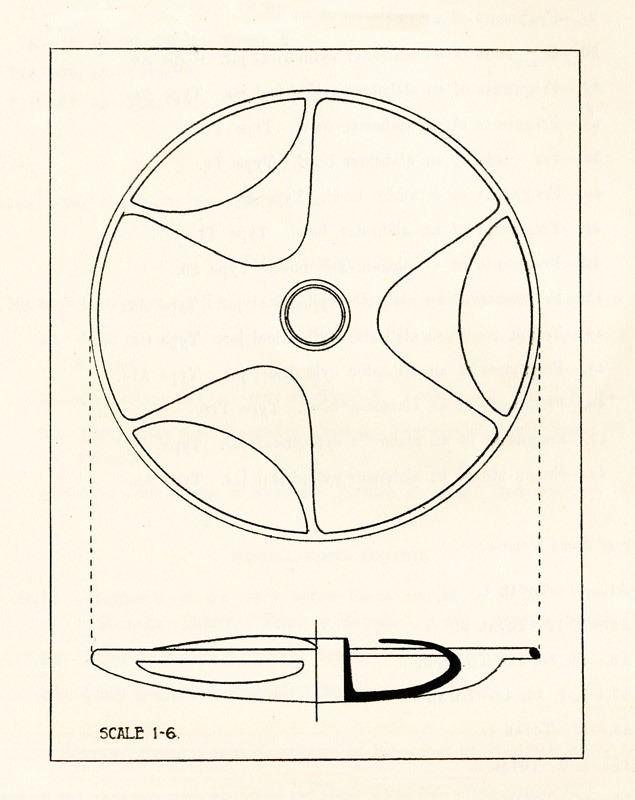 See the further discussion in the main text. 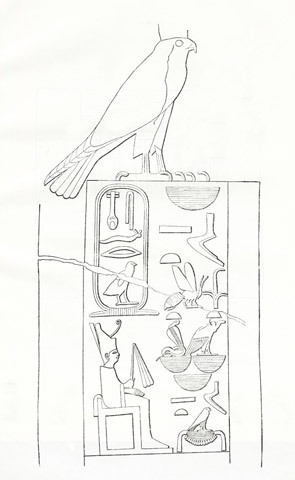 This drawing is folding Plate 11 in Jean Philippe Lauer, Histoire Monumentale des Pyramides d’Égypte (Monumental History of the Egyptian Pyramids), Volume I, Les Pyramides à Degrés (IIIe Dynastie) (The Step Pyramids of the Third Dynasty), Cairo, 1962. 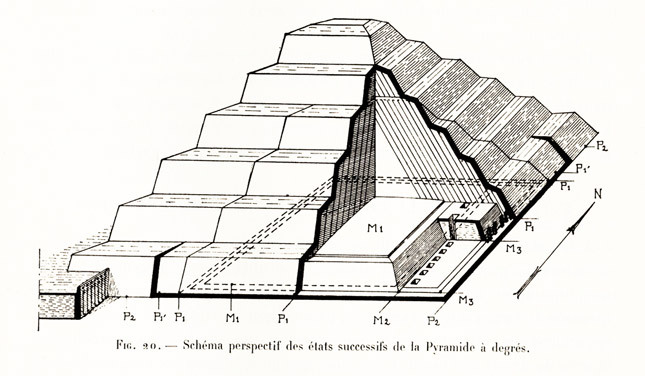 Schematic perspective view of the successive layers of the Step Pyramid [of Zoser at Saqqara]. 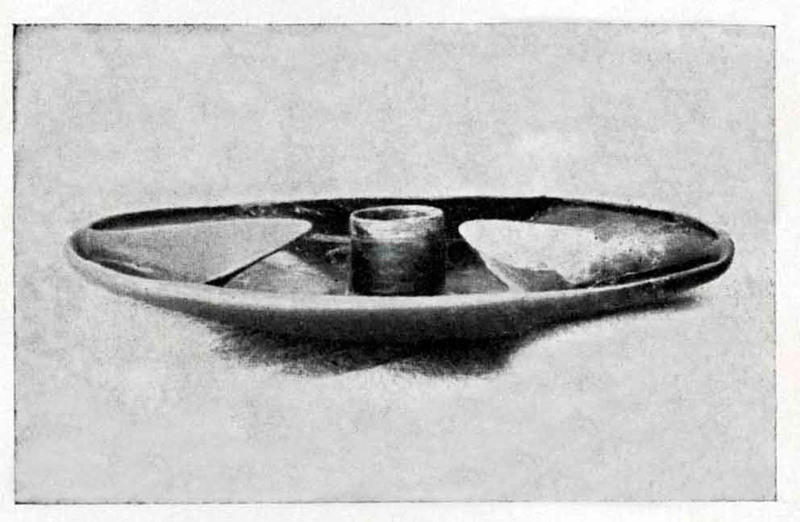 Figure 20 on page 71 of Jean-Philippe Lauer, Histoire Monumentale des Pyramides d’Égypte (Monumental History of the Pyramids of Egypt), Volume I: Les Pyramides à Degrés (IIIe Dynastie) (The Step Pyramids (Third Dynasty)), Cairo, 1962. 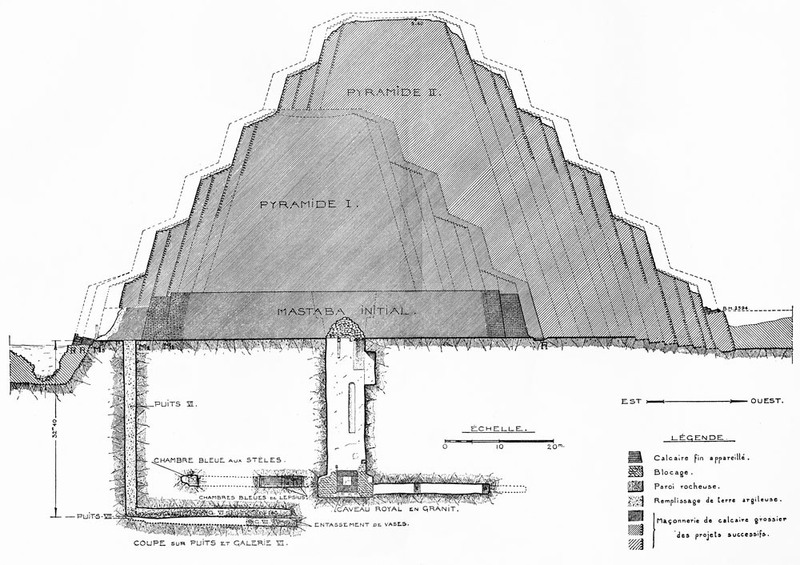 The rectangular and flat mastaba (‘M1’) was the first construction (slight modifications to it are labelled M2 and M3), the step pyramid labelled ‘P1’ was then built on top of it, and finally the Step Pyramid as we now see it (‘P2’) was in turn constructed on top of that. Image of a ‘unifier’ in his two guises, King Djer (also called Zer), second king of of the First Dynasty, shown twice on a jar sealing in his tomb, seated on his throne and holding his flail as a symbol of royal authority. At left, he wears the white crown of the South, and at right he wears the red crown of the North. In front of him, his name is contained beneath the feet of a falcon surmounting a design known as a serekh, which was the standard presentation for a king’s name at that period (later superceded by the cartouche). 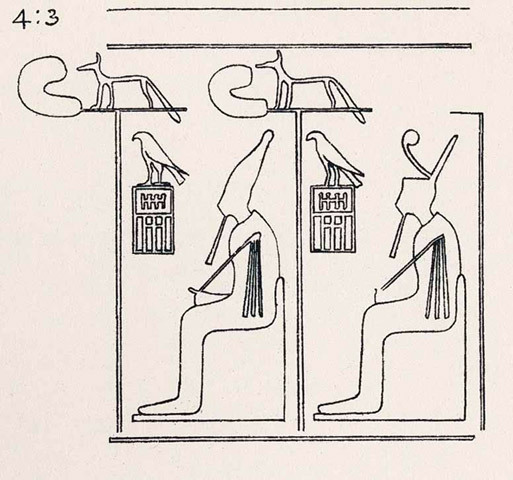 Standing in front of each image of Djer is a standard with a rampant jackal/wild dog at the top, representing either Upwawet (‘Opener of the Ways’), Khenti-Amentiu (Chief of the Westerners, the earliest name and jackal form of Osiris), or a form of Anubis (or some conception, no longer entirely clear to us, embodying all of the above ideas of deity). 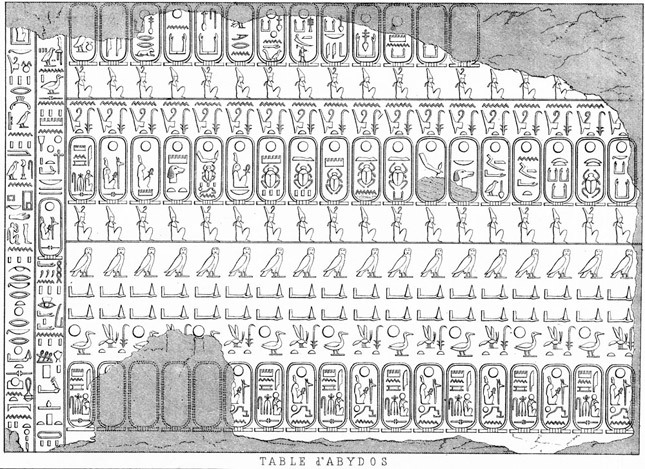 This illustration is from Figure 108 of Plate XV in Sir Flinders Petrie’s Royal Tombs of the Earliest Dynasties, 1901, Part II, Egypt Exploration Fund, London, 1901. King Narmer, as depicted on the reverse side of the Narmer Palette, striding forth with a mace in his hand and wearing the Crown of the North (Lower Egypt), generally called ‘the red crown’, though in Old Kingdom times it was sometimes called ‘the green crown’. The coil emitted from the centre of the turban (which resembles a Fibonacci spiral in mathematics) can clearly be seen to be made of something twisted. 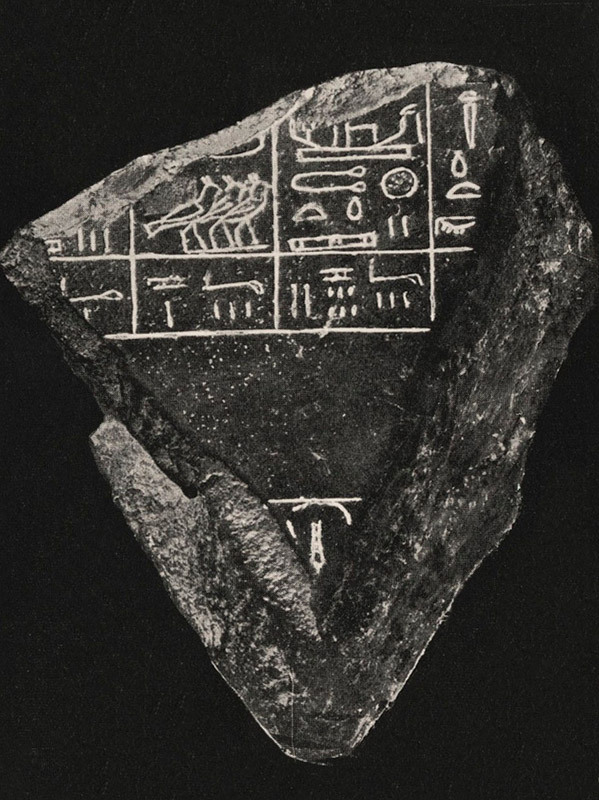 Petrie thought it was ‘a piece of tightly twisted linen, and … it must have been made over a wire or other stiff foundation to keep it in position.’ (Ancient Egypt, June, 1926, Part II, pp. 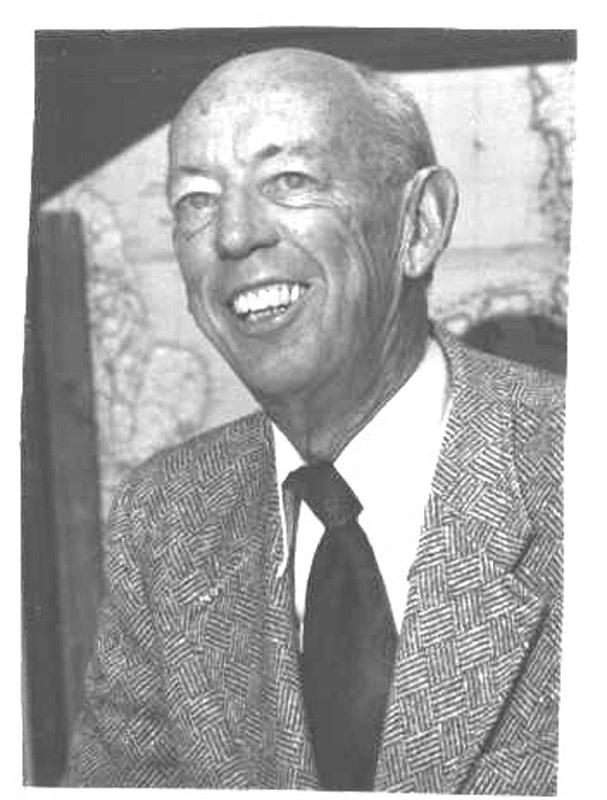 36-7). 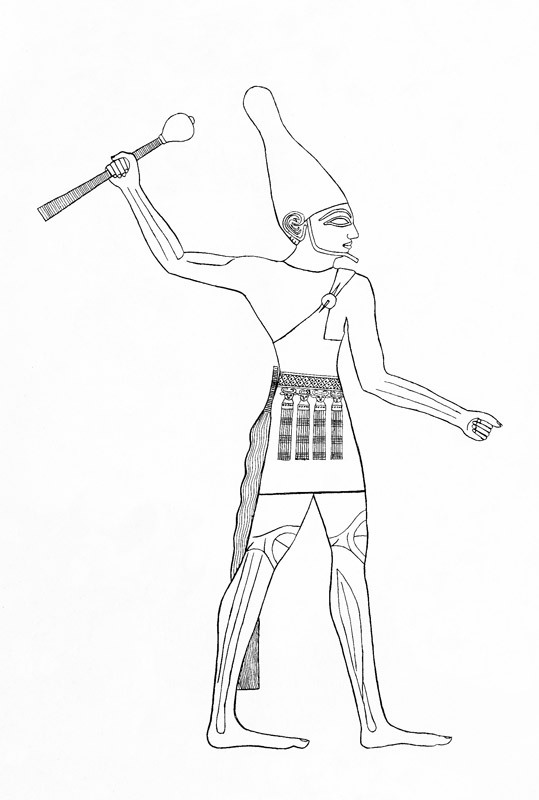 Narmer, shown on the other side of the palette in smiting position and wearing the ‘white crown’ of the South (Upper Egypt), as seen in Plate 38 and Figure 46, was evidently a southern king who conquered (‘smote’) the North, since he did his smiting while wearing the southern crown, but progressed peacefully, evidently as a victor, wearing the northern crown, with his mace at rest. Whether Namer was ‘Menes’, or whether his son How-Aha was Menes, the Unification of Egypt by force took place from the south to the north, and resulted in the creation of what we call ‘The First Dynasty’. King Narmer smiting an enemy, drawn from the obverse side of the Narmer Palette, and showing the details of his costume and mace. The Palermo Stone, obverse side. This image was given to me by the officials of the museum at Palermo, and has been digitally enhanced by Michael Lee. 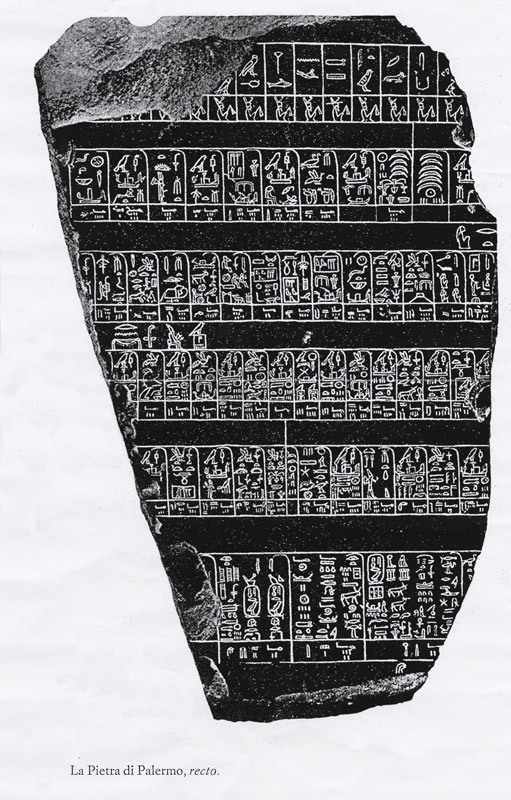 The top row, broken at left, lists the predynastic kings of the Delta in the north of Egypt (see Figure 49 for a closeup view of this row). 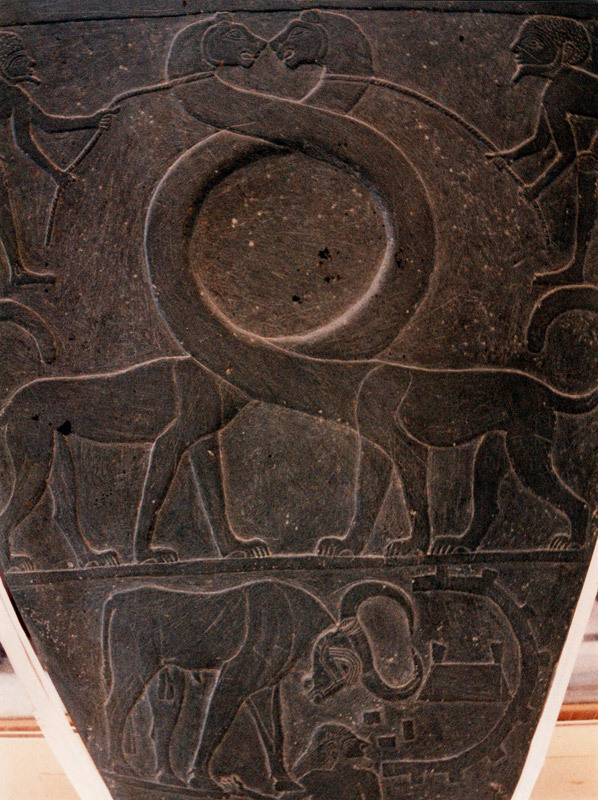 A carving found at Dashur of King Sneferu, the first king of the Fourth Dynasty and reputed father of Cheops, seated on his throne, holding the royal flail and wearing the joint crowns of the north and the south. His name is shown above him in its cartouche. To the right are the pairs of sedge and hornet, vulture and cobra, which represent ‘king of north and south’. 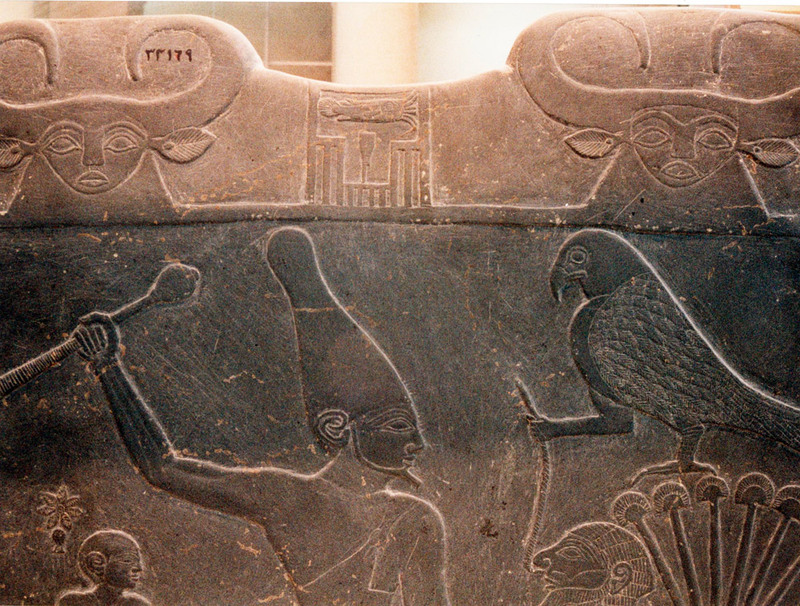 The royal Horus falcon surmounts the inscription.